Pictured is the memorial for the unidentified remains collected from the Tri-State Crematory. The memorial resides in the Tennessee-Georgia Memorial Park. This February will mark the 10-year anniversary of the discovery of hundreds of bodies at the Tri-State Crematory in Noble, Georgia. This story was updated June 29, 2016, at 10:17 a.m.
October: A gas man claims he first saw bodies scattered around the crematory. Walker County Sheriff's Office decides the complaint is a regulatory issue, not criminal, and nothing is done. November: Environmental Protection Agency in Atlanta receives anonymous tip that there are body parts in the woods near the Tri-State Crematory. Walker County Sheriff's Office does a routine check and finds nothing. Feb. 14: Federal agents receive another anonymous tip that someone walking a dog in the woods on crematory property discovered a human bone. Feb. 15: Authorities find 49 uncremated bodies scattered in buildings and on the Marsh property. Feb. 16: Crematory operator Brent Marsh is jailed on five counts of theft by deception. Aug. 27: Marsh released from jail on a $159,200 bond. Aug. 28: Grand jury indicts Marsh on 787 felony charges. Aug. 27: Attorneys in Rome, Ga., announce $80 million settlement of federal class-action lawsuit against Marsh and the estate of his late father. Nov. 20: Marsh pleads guilty. Feb. 4: Marsh begins serving 12-year prison sentence. Feb. 9: Marsh's mother, Clara Marsh, and sister, LaShea Marsh, are indicted on charges of making false statements on separate death certificates. December: Judge dismisses charges against Clara and LaShea Marsh. UPDATE: Tommy Ray Brent Marsh has been released. When the bodies started to pile up, Tim Mason wrestled with panic and disbelief. He wanted to believe that his parents' bodies weren't among those thrown out, exposed to the elements and left to rot in the backyard of a crematory in the unincorporated town of Noble, Ga.
Like hundreds of other sons, daughters, mothers and fathers who had followed the wishes of someone they loved, who had sent their bodies off to become ashes, Mason wanted to know that, in the end, they had been honored. The only way to be certain was to dig up their remains. And when he did so with a backhoe, carefully, so as not to disturb nearby sites, he found nothing of his parents in the graves he had visited for nearly seven years. His father's body was discovered lying in a barn. No trace of his mother was ever found. coffins; some had been lying out in the open for nearly five years. The findings would disgust local police, haunt families and spark a national debate about the worth of the dead. Police charged Tommy Ray Brent Marsh, who ran the family crematory business, with hundreds of felonies. He later pleaded guilty and remains in prison. More than $100 million was paid out in federal class-action lawsuits against Marsh and the funeral homes that had sent bodies to the crematory. State and local government spent nearly $10 million on cleanup and recovery. No one knows the exact number of families affected, but attorneys in the lawsuits estimated the count at nearly 2,000. In the end, what happened in the little town about 25 miles from Chattanooga led to changes in the way the nation regulates crematories. It prompted states to pass stricter laws giving public officials greater access to their books and, in Georgia, to make it a crime to throw out a corpse. But after 10 years, families still feel robbed of their last fond memories. They struggle to understand and still have questions about why Marsh did what he did. People don't like to look death in the face. They want to be shielded from it, protected. Experts say that could be one of the reasons the idea of cremation became more appealing in the United States in the late 1980s and early '90s. But in the heart of the South, people asked whether it was right to turn a body into dust. Cremation carried a stigma, and Christians wondered if it wasn't sacrilegious, local pastors said. So when the dying themselves began requesting cremation, it was hard for some families to accept. Some of the dying wanted to protect their families from the pain of watching them pass. They didn't want the traditional funeral viewing, for their bodies to be remembered as sickly or old. So some families went with their wishes, even if they didn't agree. But when the bodies were discovered in Noble, families were forced to confront not just death, but horror. And they had to live through a loved one's death twice. Bury twice. Mourn twice. Remember twice. For 20 years, thousands of bodies were sent to Tri-State Crematory. Ray Marsh, a well-liked man from Walker County, had built the facility in his backyard. It was the only crematory for miles, and funeral homes from Cleveland, Tenn., to Chatsworth, Ga., sent their bodies there. Laws regulating funeral crematories were lax. Marsh hadn't renewed his license for several years, and no one was requiring him to. For the most part, people trusted him. When he got sick in 1996, his son, Brent, a football player at the University of Tennessee at Chattanooga, quit college to run the family business. He wasn't a licensed funeral director, but state officials acknowledged they didn't monitor licenses closely at the time. 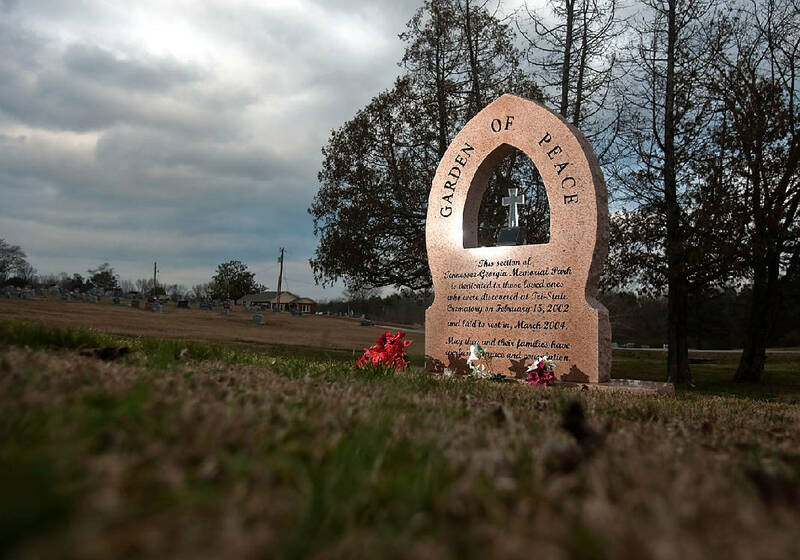 In the six years Brent Marsh ran the crematory, at least two complaints alleging possible improper handling of bodies were given to the Walker County Sheriff's Office. But the warning signs went unheeded. Then in early 2002, a local FBI secretary reported suspicions to federal authorities and on Feb. 14, federal agents were tipped that a dog had discovered a human bone on the Marsh property. An investigation was launched the next day. And what the search uncovered would unsettle hundreds of area families and the entire funeral industry for years to come. When investigators peeled back the doors of a maroon-colored garage near the front of the Marsh property, they weren't prepared for what they found inside. Coffins were stacked in piles. Bodies were still inside the boxes and tossed around the room, their fluids oozing on the floor. Defibrillators and syringes littered the ground. The bodies were found in every stage of decomposition, some having been there at least five years, officials said. Some bodies were still in hospital gowns with identification bracelets on their wrists. Others were in their best suit or dress, the way their families had last seen them. One man's body lay halfway inside the crematory oven. "It was like something out of a Stephen King novel," said Walker County Sheriff's Detective Walter Hensley, who was one of the first on the scene. "Every building you opened had bodies." Outside the buildings, a body lay inside a casket in the back of a broken-down hearse. A tall man lay decomposing in a wooden crate -- still wearing his jacket and tie. At his feet lay the skeleton of a baby. Everywhere investigators turned, someone's friend or relative was cast aside. A woman's body lay in the dirt inside a building, her dress hiked up. She was later identified as Leatha Shropshire's mother, Helen McKin. Investigators believe Marsh had dragged her across the floor and left her there. When Shropshire, of LaFayette, Ga., learned what had happened, she needed answers at any cost. A restraining order was filed against her after she was caught trying to sneak onto the Marsh property multiple times. "I lost it completely," she said. "There was so much going through my head at the time." Then investigators realized another problem. Many of the urns returned to the families of the departed were not filled with their ashes, but with cement dust. That brought on more anger. Families came from Alabama, southern Georgia and across Tennessee to demand answers. The media swarmed Noble from news services across the nation and the world. Lawmakers from across the country asked: How did it happen? Funeral homes were blamed for sending their bodies to an unlicensed crematory. Lawsuits began to pile up. It quickly became clear that lax regulation of the crematory industry was partially to blame, and states moved to correct the problem. Legislators from Georgia and other states scrambled to tighten regulations and passed laws that would allow officials to monitor crematories and the owners' licenses. Because of what happened in Noble, any crematory in Georgia now must have a license that is renewed every two years and the facility must be inspected at least once a year. A licensed funeral director also must work at the facility, said Alysia English, director of the Georgia Funeral Directors Association. If a crematory is caught operating with an expired license, officials will issue a cease-and-desist order, giving the owner 30 days to fix the problem or be hit with multiple fines and risk being shut down, English said. But the new laws are intended to correct a glaring oversight, not to prevent a disaster like the one that unfolded at Tri-State, she said. "That was criminal and mental; that kind of behavior you can't legislate against," she said. In the days after the bodies were discovered, law enforcement struggled to find an answer to one legal question: What was Brent Marsh's crime? There had been no murders, no assaults, no threats. Desecration of a corpse wasn't a felony in Georgia at the time, law enforcement officials said. Prosecutors decided he could be held financially responsible for taking money and not fulfilling the contract and not returning the bodies. He first was charged with five counts of theft by deception. But as the bodies piled up and prosecutors researched the laws, the count grew to 787 felony charges: 179 counts of abuse of a corpse, 439 counts of theft, 122 counts of burial service fraud and 47 counts of making false statements. His attorneys argued there was no monetary value to the dead. The Georgia Supreme Court acknowledged that was a valid point, but nothing was ever decided in the higher courts because the case never went to trial. So the state decided to answer the question. Lawmakers approved and the governor signed into law a measure making it a felony to throw away or abandon a corpse, punishable by up to three years in prison. But many of the families wanted more. Marsh had taken something priceless, some argued. The outrage seemed worse than if Brent Marsh actually had killed their families, said Walker County Chief Deputy Mike Freeman, who also worked the case. At every court hearing, Marsh was outfitted in body armor for his protection. Screaming, angry crowds lined the street. He and his attorney, McCracken "Ken" Poston, received death threats. As Marsh left one hearing, Shropshire ran in front of him. Clad in a T-shirt bearing a picture of her mother's face, Shropshire pointed to her mother's picture and screamed: "Look what you did!" In the end, prosecutors offered him a deal, and he took it. Poston said the Supreme Court's scrutiny and the cost of a trial that could have bankrupted the county gave him leverage at the negotiation table. But Lookout Mountain Judicial District Attorney Herbert "Buzz" Franklin said cost had nothing to do with his decision to offer a plea bargain. Some of the families finally had agreed on a punishment they felt was appropriate, he said. Marsh's sentence was 12 years in prison, concurrent with his Tennessee charges, and 75 years on probation. But not everyone was happy with the final outcome. "Some people thought the death penalty would have been appropriate," Franklin said. When Marsh was sentenced to prison, he also was required to write an apology letter to each family member who had a relative found on his property. "I am so sorry for your loss," he wrote to many families. "I pray that you will one day be able to forgive me for my failure to properly perform my duties." The words felt hollow, several families said, and the letters brought no closure. "I have not the answers that you so greatly desire," the letter went on. To people like Mason, the lack of an explanation worsened his grief. Marsh has never given a public interview. He ignored a request for an interview for this story. And he never offered an explanation in court for what happened. Mason knew Marsh and has wrestled with how a man, a friend, that he trusted could care so little about Mason's parents. When Mason's father, Luther, died in 2001, Marsh assured Mason and his wife, Neva, that he would take good care of his father and return his remains. "[Marsh] told me he would take care of him and not to worry about it," Neva Mason said. "But his body was put before animals just like trash." Every human culture treats its ancestors with some kind of respect; there is a reverence for those who have gone before, said Georgia's chief medical examiner, Kris Sperry, who also worked the case. "It's a transgression that is hard to wrap your mind around," he said. Theories have circulated about why Marsh did what he did, but no one knows for sure. He got behind on his work, Walker Sheriff Steve Wilson suggested. He didn't want to be involved with his family's business anymore, Detective Michelle Brown said. He had developed mercury poisoning from being exposed to fumes from the silver fillings in teeth as bodies burned, said his attorney. It was as if his mind was in a fog, and he isn't even able to explain what happened, Poston said. Marsh remains in prison in South Georgia. He has been denied parole twice, and his case will be reviewed again next year, said Steve Hayes, a Georgia Board of Pardons and Paroles spokesman. As for the rest of the family, Ray Marsh died in 2003, and charges eventually were dropped against Clara Marsh and her daughter, LaShea. While they had helped operate the family business, prosecutors and police said there wasn't substantial evidence to show they knew what was going on. In Noble, the crematory is gone, but Marsh's mother still lives on the 11-acre property. A wire fence surrounds the land, and a "no trespassing" sign hangs near the entrance. A knock at the one-story house brings her to the porch. "Nobody cares about us," she says, peeking around the edge of the house, then abruptly walks away. A stone at the Tennessee Georgia Memorial Park southeast of Rossville marks the place where 133 bodies that couldn't be identified are at rest. The marker reads: "May they and their families have everlasting peace and consolation." But for many, there is more anger than peace, even now. Shropshire keeps the urn of her mother's found remains in her home. Outside, she has planted a flower memorial in her front yard. She won't trust anyone with what is left of her mother. In 2003, she tattooed a blue tear drop under her eye so she would never forget. Others still are looking for answers. Officials say every body was exhumed from the Marshes' property and every expense taken in an attempt to find DNA matches. But even they admit no one knows the total body count, because so many were never accounted for. Some families believe there still could be unidentified bodies buried on the Marsh property. Teri Crawford, whose brother was sent to the crematory and who worked for the state to recover bodies, wrote a book in which she accused officials of incompetence and a cover-up to protect the Marsh family. Pits were overlooked and bodies were misidentified, she said. She is haunted because she never found her brother's body. "I don't know what to do next," she said. Mason never found anything of his mother, and he said he thinks about that every day. "You know it's just a body. It's not going to be used again," he said. "But it's precious to you."